The Salter-Harris Type I fracture is considered the “simplest” in the classification system. That is not to say these injuries cannot be serious. This injury type does not involve either the epiphysis (the portion of bone between the growth plate and the bone's tip) or the metaphysis (portion of the bone that lies proximal, or before, the growth plate i.e. the shaft) This injury occurs within the growth plate and can display various degrees of positional changes. The Salter-Harris Type I fracture is typically not visible on x-ray, as was mentioned on our “Salter-Harris Fractures” page, again because the newly formed, immature bone cells are not calcified enough to deflect x-ray beam penetration. It is because of this characteristic that diagnosing simple Type I fractures can often be difficult, forcing the practitioner to treat the injury more on the basis of symptoms(pain and swelling over the area of the growth plate)and clinical expertise, than x-ray confirmation. 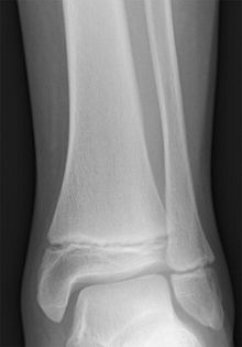 The x-ray below shows a normal pediatric ankle with normal looking growth plates at the ends of the tibia (shin bone) and the fibula (outer knob of ankle). Type I fractures can be serious and troublesome, especially when they involve some level of positional changes, also known as “displacement”. Technically speaking, displacement refers to the alteration of normal position and alignment of a bone due to a fracture, dislocation or other traumatic injury. Displacement of a fracture can occur in literally any direction and describing the direction a fragment has moved relative to the rest of the bone, i.e. dorsal, volar/plantar, lateral or medial, can give instant quality information to the orthopedic or pediatric specialist when determining optimal treatment. Think of the bones on either side of a growth plate, and the growth plate (or "physis") itself, as an Oreo cookie. Take the cookie and “shear” the two sides from the filling… The same thing happens to the growth plate in this injury type. 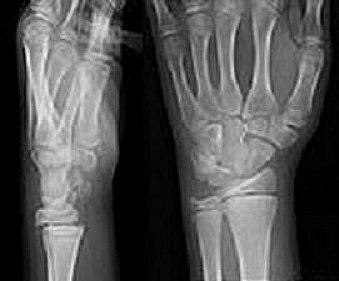 The x-ray below demonstrates a Type I fracture of the distal radius bone at the wrist. The lateral view, or sideways projection, illustrates what “dorsal displacement” looks like. Just a note here.... These fracture types can occur in literally any bone that has a functioning growth plate. However, some of the most frequently seen growth plate injuries typically involve the ankle, wrist and fingers.